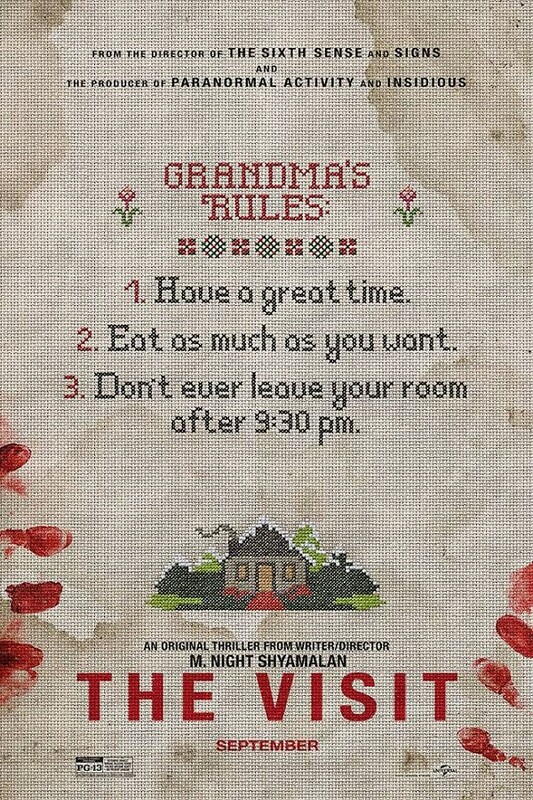 We went to see "The Visit" last night. VERY good. It was written by M Knight Shyamalan. He wrote and directed two of my favorite movies, "Signs" and "Sixth Sense". He also wrote two of my least favorites, "The Happening" and "The Last Airbender". He is back in fine form. A single mom, (played by Kathyn Hahn) of two children is estranged from her parents. Things work out so the children can meet their grandparents when the go visiting by themselves for a week. The children a young boy and teenage girl (Ed Oxenbould and Olivia DeJonge). They are good kids but obsessed with movie making. The film is filled with comic relief but mounting tension too. I can't say much more so my review will be "Spoiler Free". It does have a lot of shaky filming because much of it is from the children's point of view. Just close your eyes if that gives you motion sickness. It's really a good movie. Go for coffee afterwards so you can talk it over. It's that type of film.